Just last night, on a whim of revisiting some of my early heavy metal history, I dusted off my copy of Def Leppard's High N Dry and gave it a spin. I love that album. One of my favorite introductions to NWoBHM, the joy of twin guitar harmony, and genuine melodic heavy metal. I recall having it back to back on a homemade cassette with AC/DC's Back In Black. So here's Sweden's Lethal Steel who's giving me more than a little deja vu all over again. Just one look at their appearance will jolt you and your memory back to 1980. Lethal Steel's debut album, Legion of the Night, culled from an early four song demo with some new tunes, is straight up old school heavy metal. Like "keep it true" heavy metal. There is massive, like bitchin' massive, twin guitar harmonies in riffage and solos. I can't say enough about the twin guitar angle. The solos are amazing and abundant. Alternatively, you might note a slight redundancy, the twisting of the same chords for similar results. Listen to the beginning of both Nocturnal Seductress and Demon From The Past. While you can't quite understand the vocals, Viktor Gustafsson sings clean and melodic, has some controlled range, and never attempts to go screeching screamo. 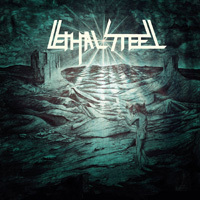 Lethal Steel drops in some gallop from speed metal to remind you that modern power metal's roots are deep in classic heavy speed metal. Overall and bottom line: With Legion of the Night, Lethal Steel is dead on target with their interpretation of classic heavy metal. It's both powerful and entertaining, and easily recommended. With Legion of the Night, Lethal Steel is dead on target with their interpretation of classic heavy metal. It's both powerful and entertaining, and easily recommended.